"Graffiti comes to life in the dark heart of Atlanta’s oldest cemetery, slaying one of the city’s best loved vampires before the eyes of his friend Dakota Frost. Deadly magick is at work on the city’s walls, challenging even the amazing power of Dakota’s tattoos to contain it. The hungry, graffiti magick loves to kill, and the Edgeworld is no longer safe from its own kind. Wow, this was a quick read! Fast moving, quirky and so much fun to read - this book can definitely be a stand-alone one. I read "Frost Moon" few weeks ago, but I can say it's not necessarily to read it beforehand if you don't want to. And look at the Cover - I love it! Sets the mood so well for the book! I still love seeing Dakota handle Cinnamon, it's probably my favorite relationship throughout the two books. Her "becoming" a mother for self-proclaimed were-tigger is so much fun to read! ❝Beside me sits a five-nothing teenaged girl, listening to a podcast on her iPod. Normally she’s dressed in a vest and Capri pants, but today she’s in a shockingly conservative schoolgirl’s outfit that clashes with her orange hair and elaborate tiger-striped tattoos. At first what you see is easy to interpret: an outsider trying to fit in, or a rebel suffering a forced fit. But then your eyes do another double take: are those … cat ears poking out from beneath her head scarf? Did they move? And is that a tail? My God, honey, could she be one of those … what are they called … “were-cats”?Why yes, her ears did move, and yes, she’s a weretiger. But didn’t your mom tell you it’s rude to point? She has a name: Cinnamon Frost. And she’s my adopted daughter. Don't get me wrong I love seeing her in a more romantic mood as well with not one but two interests! Of course that can never last which makes reading the book even more fun. And the suspence and invetigating well I'm a sucker for well written mystery getting resolved, and adding vampires, weres and magic to that - sold! 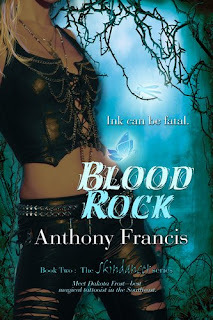 Francis has a way about his writing that is just refreshing and intriguing, he has created a world of unique vampires and weres and isn't shy about making Dakota appreciate the female form as well. I love Dakota and definitely liked this book! 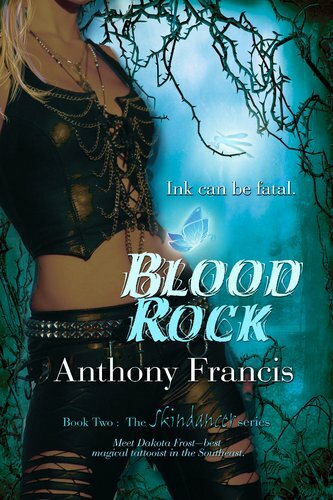 So wither you want to check out "Frost Moon" first or just read Blood Rock, I recommend them both.